If you're thinking of staying with us and wondering what kinds of things there are to do around town, we've provided a list of some of our favorites below. Click on the titles to find out more about each activity. An inflatable playplace for kids of all ages. Slides, obstacle courses, and all out fun. Great locally sourced and grown goods from Athens. One of Watkinsville's own lovely art galleries featuring a wide variety of artists and mediums. Great public parks for the whole family. 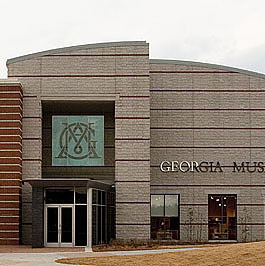 A great museum with family days featuring some of the world's most renowned artists as well as local talent as well. Beautiful, sprawling gardens. The gardens have great walking and hiking trails, and plenty of beautiful scenery to see. A relic of years past. Visit this famous, albeit ineffective piece of military history. An Athens landmark. The tree was willed its own ownership by the owner of the property and now owns itself. A great local farm that features strawberry picking, a pumpkin patch, and even corn mazes. Fun for the whole family.